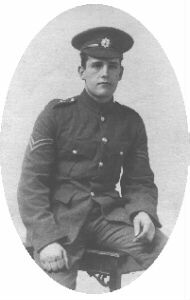 Ernest was not one of the brothers, he was the second son of Walter however his story merits a page on this site. 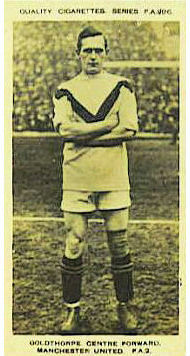 Ernie Goldthorpe, the son of Walter a member of the famous rugby family, was himself a well known sportsman. He was born in Middleton, Leeds on the 8th June 1898. Unlike his father and uncles Ernest adopted the game of soccer in preference to rugby and he began his career with Yorkshire Schools. During the war he served with the pay corps of the Coldstream Guards and while stationed in London he joined Tottenham Hotspurs, where his regimental colonel had an interest, and with whom he played until the armistice was signed. He then came back north and played the 1919 - 20 season with Bradford City before moving to Elland Road where he had the honour of playing in Leeds United's first league game and was the first Leeds United player to score a penalty. He had two injury hit seasons with his local team, in which he made six appearances and scored two goals. 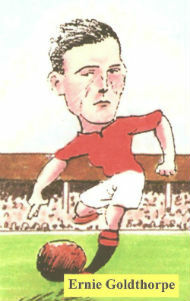 In March 1922 he briefly returned to Bradford City before being snapped up on a free transfer by Manchester United. 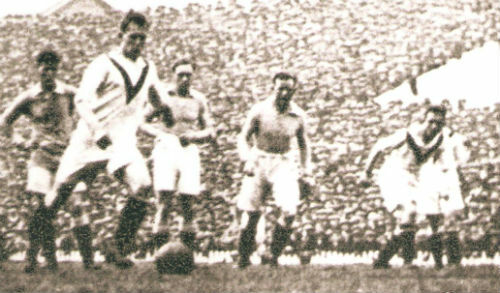 He scored on his debut for the reds in the away game against Leyton Orient in November 1922. The following year he scored the club's quickest ever hat trick when he completed the achievement in four minutes against the league leaders, Notts County. He scored four goals in United's 6-1 win. 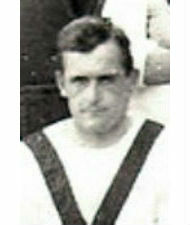 Ernie went on to make 30 appearances for the Old Trafford club scoring 16 goals. After three years he was transferred to Rotherham United for whom he made just two appearances before injury brought an end to his career. Ernie was known as a talented and dashing centre forward but due to many injury problems he was never able to fulfil his potential. He was also a useful local badminton and tennis player reaching Leeds area tennis finals in partnership with his wife. Away from the sporting arena Ernest Holroyd Goldthorpe, worked in a bank, was married to Laura and had a daughter, Beryl. The family lived in Woodville Mount, Leeds. Sadly Ernest died at the age of 31 as the Yorkshire Evening Post of Thursday November 6th 1929 reported. "Famous Footballer Drops Dead in Street"
"Pneumonia and strain while at play"
"One of the second generation of the famous Goldthorpe family of Hunslet died with tragic suddenness and his death was the subject of an inquest by Leeds deputy coroner this afternoon. Dr Hoyland-Smith said death was due to heart failure following acute double pneumonia from which had been suffering for only 24 hours. Severe exertion while playing badminton would be, he said, a secondary cause of collapse. death from natural causes was the verdict." The report continued "Ernest Goldthorpe son of Walter, nephew of Albert and James, had been playing badminton at St Oswald's Institute, Hunslet, last night, and was on his way home when he died. His home was at Woodville Mount, Hunslet Carr and he ran up Belle Vue Road in order to attend to his poultry before going home, 150 yards away, but he died before a doctor could be called." Ernie's mother was convinced that her son could not have taken part in any strenuous activity with pheumonia and the family doctor's opinion was that his heart had enlarged. Over recent years occasional reports of "sudden death syndrome" amongst young fit athletes have been reported. This could have been the cause of Ernie's death.